At Orthodontically Yours, we believe everyone deserves a beautiful, healthy smile. That's why our doctors and highly trained team of orthodontic specialists work hard to design specialized treatment plans that perfectly suit our patients' unique orthodontic needs, and why we strive to make every patient feel at home each time they come into our office. While we see patients of all ages, there's one demographic that we treat more than any other: adolescents. Braces have become something of a right of passage for teens, and they've come to exemplify the other changes - both physiological and personal - that adolescents go through. In fact, there's good reason for adolescence to be the prime time for braces. For starters, by the time children reach adolescence, the baby teeth have fallen out and most or all of their permanent teeth have erupted, allowing us to make changes in tooth alignment that last a lifetime. We can also take advantage of the natural growth spurts that occur during adolescence to speed up treatment and move teeth more effectively. There's also a social element - because braces are so common, teenagers are far less resistant to getting them. In fact, some teenagers want braces just so they can fit in with their friends! It's also important to note that orthodontic problems, also called malocclusions, don't get better with age - they just get harder to treat. In adulthood, the bones of the face and jaw set in place and become more rigid, making it much more difficult (and expensive) to correct them. By treating them right as the permanent teeth finish erupting, we can fix them while they're still at their most benign, allowing us to quickly and effectively create a beautiful smile that will last a lifetime. 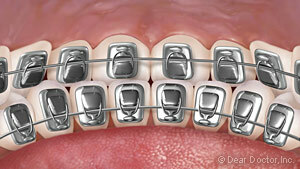 Metal Braces: These are what most people think of when they hear the word 'braces.' Today's braces are smaller, more comfortable, and more aesthetically appealing than ever, and we can even customize them with colored elastic ties for the brackets. Clear Braces: These use the same fundamental method as braces, but the brackets are made from a clear composite material that blends in with teeth. They offer an improved appearance and are great in many cases, but they do carry a bit of a higher price tag. Clear Aligners for teens: The Invisalign System does away with metal brackets and wires altogether, instead using a series of clear, removable plastic trays - called aligners - to straighten teeth. Invisalign Teen also offers a variety of features custom-tailored to the teenage lifestyle, including the Blue Dot Wear Indicator, eruption tabs, and extra replacement aligners completely free of charge. 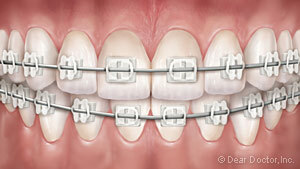 Lingual Braces: These are a truly invisible form of treatment. They still use metal brackets and wires, but the brackets are mounted to the inside (tongue side) of teeth, making them completely invisible from the outside! In some cases, where major tooth or jaw movement is required, we may recommend other appliances ranging from small devices in the mouth to headgear. Don't worry, though - they're temporary, and once you're finished with them, you'll have a beautiful smile to last your entire life. Treatment times vary drastically from patient to patient, so there's no one-size-fits-all answer. Generally, though, treatment lasts from 6 to 30 months, with the average lasting 6-18 months. 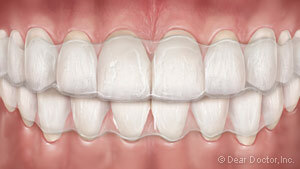 Once you're finished with your braces, you'll wear a retainer for a number of months. After that, you'll have a beautiful new smile that'll last the rest of your life! 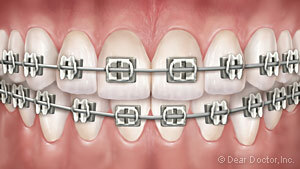 Have more questions about braces or want to come in for a visit? We're here to help! Feel free to reach out to us at our contact page with any questions or use our easy online form to schedule an appointment at our Mississauga or Thornhill, ON office. We can't wait to hear from you, and we look forward to helping you achieve a beautiful, healthy new smile!